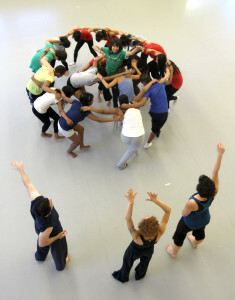 Dancing to Connect℠ (DtC), an award-winning initiative, engages participants in creativity and team-building through the art form of modern dance. Students of all abilities work under the guidance of Battery Dance ’s teaching artists, who are also world-class performers, creating and performing choreography of their own devising. Dancing to Connect workshops open doors for teens as they transition into the leaders and engaged citizens of tomorrow. Dance takes the thinking and creative processes into a physical space, providing students with a non-verbal means of expression. Through an intensive week-long series of four to five-hour workshops, students find in dance a new and different way to realize themselves, using their own experiences to create their own choreography, which they then perform on stage along with Battery Dance’s world-class dancers. 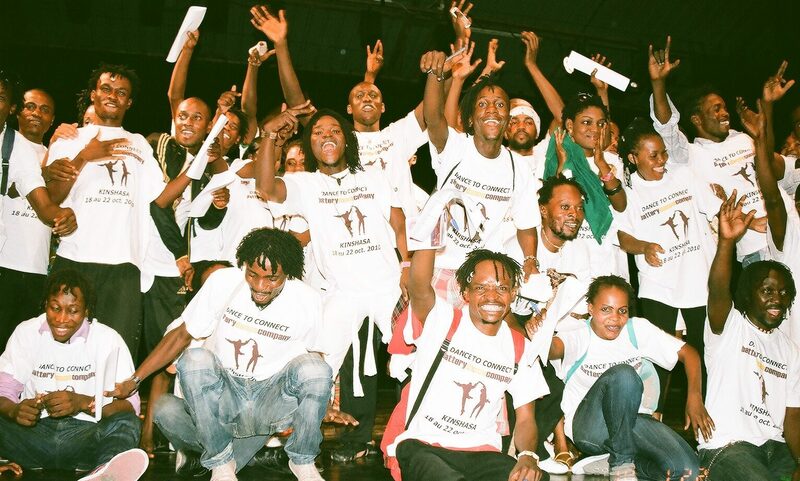 The Dancing to Connect program has been used to bridge divides, unite communities, empower youth and the disabled, combat bullying and xenophobia, and provide access to dance to all people regardless of socio-economic status. See more results of our program evaluations here. In conjunction with the workshops, Battery Dance Teaching Artists can be paired with local dance instructors who act as teacher trainees. Mirroring the Battery Teaching Artist, teacher trainees learn how to conduct the Dancing to Connect Program, helping to ensure the future sustainability of the program. 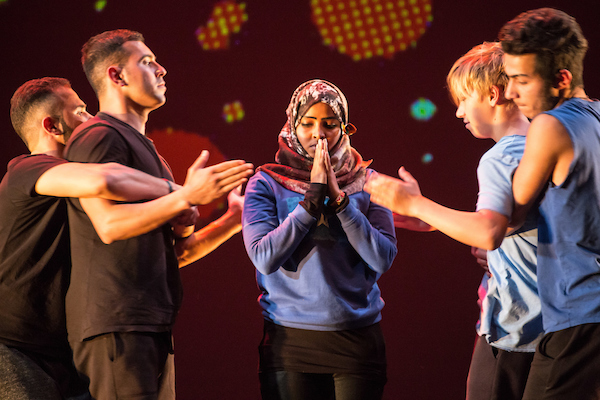 Inclusion / Exclusion: Workshops focused on ending bullying, combating xenophobia and/or ending discrimination whether it be based on religion, nationality, ethnicity, age, or class. Program Examples: New York City public high-schools (annually), Germany (2010), Wealthy and impoverished youth in Brazil (2012), Roma and non-Roma in Europe (2013), Muslim Immigrants and native French Youth (2014), Immigrants and non-immigrants in Spain (2011) & Greece (2013), HIV and AIDS positive adults and non-positive adults in the Democratic Republic of Congo (2010). Conflict Resolution & Prevention: Workshops focused on bringing together youth from communities that have been in conflict, are near conflict, or are in conflict. Empowering the Less Advantaged: Workshops focused on providing hope, confidence, leadership and life skills such as teamwork and listening skills, to the least advantaged youth in society and/or troubled youth. Gender Based Violence & Human Trafficking: Programs focused on propagating mutual respect between genders and ending gender-based violence. The Disabled: Workshops focused on the disabled aim to change public perceptions of the disabled, participant perceptions of what they can achieve, and to give attention to the needs of disabled communities around the world. Refugee Integration: Programs designed to integrate newly arrived refugees and unaccompanied minors with their counterparts in their new communities. Workshops also address the trauma faced by the refugee youth, and provides a new means of healing and understanding. Program Example: Germany Refugee Integration Program (2016-2019). Learn More Here. School Subject Areas: Utilizing school curriculum objectives, workshops themes are devised to give participants a new understanding of a school subject area, such as History, the Environment, Literature, and Fine Arts. (3) A network of contacts with foreign government agencies, NGO’s as well as the State Department’s Regional Bureaus, Embassies, and Posts. 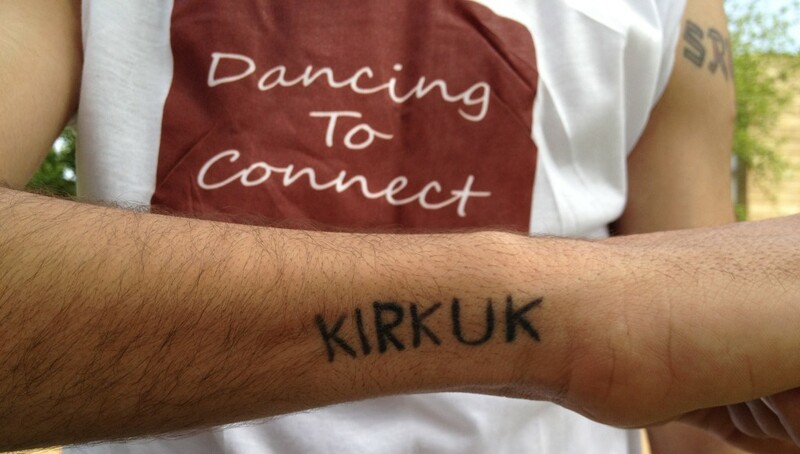 Thus, more than most other American performing arts organizations, Battery Dance is uniquely positioned to help nurture and promote international cultural engagement worldwide.